In line with the "Better Regulation" guidelines 3 , the evaluation assesses the effectiveness, efficiency, relevance, coherence and EU added-value of the PSI Directive, and aims to identify opportunities to reduce regulatory costs and to simplify the existing legislation without negatively affecting the achievement of the underlying policy goals. In the May 2017 Mid-Term Review of the Digital Single Market Strategy (COM(2017) 228 final) 4 , the Commission announced that it would, "in spring 2018, based on an evaluation of existing legislation and subject to an Impact Assessment, prepare an initiative on accessibility and re-use of public and publicly funded data and further explore the issue of privately held data which are of public interest". With the review of the PSI Directive 5 , the Commission can fulfil the periodic review obligation contained in Article 13.1 of the Directive, which stipulates that "the Commission shall carry out a review of the application of this Directive before 18 July 2018 and shall communicate the results of that review, together with any proposals for amendments to this Directive, to the European Parliament and the Council", and at the same time contribute to fulfilling the goals of the Digital Single Market Strategy in the field of the data economy. Pursuant to this commitment, this REFIT evaluation has been carried out back-to-back to the Impact Assessment 6 on policy options for the future of the PSI Directive. The conclusions of this evaluation have – where relevant – fed into that Impact Assessment. The evaluation covers the overall functioning of the Directive, but has a special focus on the changes introduced in 2013. Although the overall functioning of the Directive was already evaluated once in 2009, it is believed that the evaluation of the 2013 changes cannot be performed in isolation and must be linked to the overall assessment of the effects of the Directive. National transposition measures are not part of the scope of this evaluation. This evaluation includes all EU Member States and covers the period starting from the transposition deadline of the Directive (July 2015) to January 2018. Public bodies produce, collect and hold a wealth of information and content, ranging from statistical, economic or environmental data to archival material, collections of books or works of art. 7 Prior to the 1990s this information was difficult to access and usually solely available in paper formats. However, the digital revolution that started in the 1990s put the spotlight on the potential of public sector information (PSI). PSI (and data in general) soon started to be seen as important raw material that, if made available for re-use, could become a valuable economic asset and an important resource for economic growth and competitiveness. The focus on PSI resulted in a number of initiatives at the national, European and international level. However, with this renewed interest in PSI, public sector bodies started trading with it, which soon led to distortions of competition in the internal market. The Directive aimed to facilitate the re-use of PSI throughout the Union by harmonising the basic conditions for making PSI available to re-users, to foster the development of Community-wide products and services based on PSI, and to avoid distortions of competition. The Directive is based on Article 114 of the EU Treaty and builds on key pillars of the internal market: transparency and fair competition. The Directive succeeded in harmonising the basic legal framework for re-using PSI in the internal market in order to facilitate the re-use of PSI across the EU, where the Member States used to apply markedly different rules and practices, and in order to eliminate certain anti-competitive practices by public sector bodies. Nevertheless, despite this achievement, implementation of the Directive and progress in PSI re-use across the Member States was uneven and much of the potential of PSI remained untapped as many resources were locked in, difficult to find or made available on prohibitive terms, thereby preventing development of the national and EU PSI re-use markets. This potential had further grown because of technological advances: the so-called web 2.0 showed the potential opportunities related to mixing different data sets, and visualising them through so-called mash-ups. This was further reinforced by the sudden development of the mobile app market, kick-started by the launch of the iPhone ecosystem in 2007. Therefore, ten years after it came into force, Directive 2003/98/EC was amended by Directive 2013/37/EU in July 2013, with the aim to encourage Member States to make as much material held by public sector bodies available for re-use as possible. This intervention was part of a range of initiatives implemented in the framework of the Digital Agenda for Europe 11 and the Europe 2020 12 strategy for smart, sustainable and inclusive growth. ·insufficient enforcement of re-use provisions. To address the above concerns, the general objective of this intervention was to contribute to economic growth and job creation by improving the conditions for the exploitation of PSI and facilitating the further development of the internal PSI re-use market. Moreover, facilitating the re-use of PSI further was supposed to have a positive effect on the transparency, efficiency and accountability of governments and contribute to citizen empowerment. 3)stimulate cross-border exploitation of PSI. 3)Limited re-use linked to formats in which PSI is made available: the 2013 changes included a recommendation that public sector bodies should, as far as possible, make PSI available in open and machine-readable formats. ·number and character of complaints and other reports from citizens and business to the Commission. The review process was supported by a study, conducted by a consortium 16 , on the functioning of the PSI Directive. 17 The aim of the study was to assist the Commission in evaluating the existing legal and policy framework applicable to data access and re-use (assessing the role which the PSI Directive has played in promoting PSI re-use across Europe), and checking whether it could be improved to address some of the weaknesses identified and/or new issues which have emerged since the last revision of the Directive (in particular by assessing the expected impacts of a number of policy options/combinations thereof). The study relied on a combination of sources and methods, including strategic interviews 18 , desk research, interviews with stakeholders at the EU and national levels 19 , workshops with public sector practitioners and academics, as well as with PSI re-users and data economy players, three online surveys with public authorities, including public cultural institutions, education and research bodies, as well as the re-user community, and analysis of the public online consultation launched by the Commission. The original data collection focused on a representative sample of 10 EU Member States: Estonia, France, Germany, Greece, Ireland, Italy, Netherlands, Poland, Slovenia, and Sweden. The Commission has analysed the latest available Member States reports as part of its monitoring of the PSI Directive pursuant to Article 13(2) of the Directive. 23 Additional input from Member States was received at a meeting of the Member State Expert Group on PSI on 15 November 2017. An Inception Impact Assessment was published on the dedicated Better Regulation webpage 26 and it was available for feedback for 4 weeks (18 September 2017 - 16 October 2017). Seven stakeholders sent replies. A public online consultation was published on the dedicated Consultations webpage 27 and it was available for feedback for 12 weeks (19 September 2017 - 16 December 2017). All interested parties, including governments, public sector content holders and users, commercial and non-commercial re-users, experts and academics as well as citizens were invited to contribute. The online questionnaire covered both the evaluation of the current Directive implementation and the problems, objectives and possible options for the future. Respondents also had the opportunity to upload a document, such as a position paper. With several targeted actions, the Commission made stakeholders aware of the public online consultation and called on them to participate. Feedback was received from 273 stakeholders. A total of 63 contributions received until the end of the consultation process, end of January 2018, were taken into account. ·23 January 2018: high-level roundtable on opening up data in the transport and utilities sectors. Several ad hoc meetings have taken place with stakeholders' representatives, such as E3PO 28 , the Union internationale des Transports Publics, the German Verband Deutscher Verkehrsunternehmen and Compass Gruppe, and the French Union des Transports Publics and Institut de la Gestion Déléguée. ·Numerous sources that cover the data economy in general, the value of open data, issues related to PSI, and other similar topics have been identified and taken into account. There are differences between the studies in terms of their objectives and scope, their specific approaches towards quantitative and qualitative data, as well as the types of specific estimates they contain. An important difference between the studies is their focus. Whereas some concern the data economy in general, others concern open data or PSI itself. ·The study to support the review of the PSI Directive 30 used a representative sample of 10 EU Member States, selected on the basis of geographic balance and the score in Open Data Maturity index. 31 This naturally limits accordingly the findings on an EU-wide level for all 28 Member States. ·The evaluation takes into account the inherent limitations of the findings of public consultations. Firstly, as in all surveys, the answers received reflect the views of a sample of relevant stakeholders and not those of the entire population who have a stake in this domain. Secondly, stakeholders' views convey an individual rather than a holistic perspective. Based on the elements above, this evaluation has been carried out on the basis of the best available data. Pursuant to the Commission Better Regulation Framework, the Directive has been subject to an overall assessment, as well as to a more specific evaluation process against the following five criteria: effectiveness, efficiency, relevance, coherence and EU added-value. The evaluation questions for each criterion can be found in Annex 1. Following the last revision, the implementation of the PSI Directive by the Member States is monitored by the European Commission on the basis of Article 2 of the amending Directive. 32 It provides that "by 18 July 2015, Member States shall adopt and publish the laws, regulations and administrative provisions necessary to comply with this Directive. They shall immediately inform the Commission thereof" and "shall apply those measures from 18 July 2015." At that time, full transposition was notified to the Commission by 11 Member States. For this reason, the Commission started in September 2015 formal infringement proceedings against 17 Member States that had not yet notified the relevant national implementation measures. The last Member State notified transposition on 15 September 2017. The table below contains an overview of the way in which the Member States have transposed the 2013 revised Directive. The latest Member State reports confirm that PSI is generally made available through national data portals. They mostly harvest metadata and datasets from institutional and local portals, but in a few cases data are uploaded directly on the national portal as the exclusive point of access. The national data portals contain asset lists of metadata and most countries have defined their categories of data based on the G8 Open Data Charter priority domains. 34 Most countries have guidelines for the publication of open data attached to their national data portal, together with templates for the datasets and metadata. As regards the redress practices, Member States reports reveal that two different models are being used. The first relies on a designated, independent appellate body to handle requests for redress and can be found in Croatia, Cyprus, Ireland and the UK. The second, most common redress model relies on the administrative law of a particular Member State. As the internal structures of each Member State differ to varying degrees, so do the appeal avenues. At the EU level, over the last 5 years, PSI related issues have been the subject of 9 complaints to the Commission. Finally, it is important to point out that some Member States are moving faster on PSI re-use and are exploring new areas, while others limit themselves to the implementation of the Directive. For example, with the Loi Pour une République numérique 35 France has started addressing the issue of data generated as a result of activities carried out by public and private entities carrying out public tasks in the transport and utilities sectors. Finland 36 has enacted legislation which aims to enable the data economy to benefit from new sources of data. These efforts, while in line with the overall objectives of the PSI Directive, are not coordinated and risk undermining the level playing field for commercial re-users, as well as the development of cross-border applications in the EU. Overall the available evidence indicates that the PSI Directive works well and successfully contributes to the achievement of its main policy objectives, which are to stimulate the digital content market for PSI-based products and services, to stimulate cross-border exploitation of PSI and to prevent distortions of competition on the EU market. Since the adoption of the last version of the Directive in 2013, the Digital Single Market and the European economy in general have seen fast development in terms of data. For instance, the value of the European data economy has grown from 285 billion EUR in 2015, representing over 1.94% of the EU GDP, to 300 billion EUR in 2016. Moreover, the number of data companies increased from around 129,000 in 2013 to 134,000 in 2016. 37 PSI re-use is particularly relevant for the creation of SMEs. For example, the project ODINE 38 funded by the EU under the H2020 programme, an incubator for start-ups using open data, found a positive correlation between the maturity of the national open data policy and the number of ODINE successful applicants from that specific country. This exemplifies how a rich open data environment provides favourable conditions for innovators in this field. One third of ODINE 39 members state that they would not exist without open data. This suggests that most of these businesses are likely to have started solely with the intention to exploit the value of open data or have since founding become so reliant on open data that they would no longer be able to exist without it. Another third said they would struggle to exist without open data which indicates a significant reliance on this resource. Bike Citizens 40 , an Austrian start-up, was established in 2011 with the aim of sharing valuable knowledge about cycling in urban areas. Having started with a simple bike navigation app and a smartphone mount, the company nowadays focuses on cycling promotion, app technology and data analysis for cities. Its key service, the Bike Citizens app, uses free geodata from OpenStreetMap, which is populated with Open Data from national mapping agencies and other public sector bodies (e.g. Direction Générale des Impôts in France, Surveying and Mapping Authority in Slovenia etc. ), in order to generate different kinds of maps, including world maps. The Open Data sets allow to identify high-traffic streets and mobility patterns of everyday cyclists that are represented in heat maps. Using Open Data, the app offers the best route in 300 cities all over Europe. The company employs 25 people and has further expansion plans for Europe and the US. The better availability of PSI across the European Union is reflected in the Open Data Maturity Index 2017. 41 This index shows that nowadays the majority of the EU Member States qualify as open data fast trackers or even trend-setters, which was not the case back in 2015, as the two figures below show. 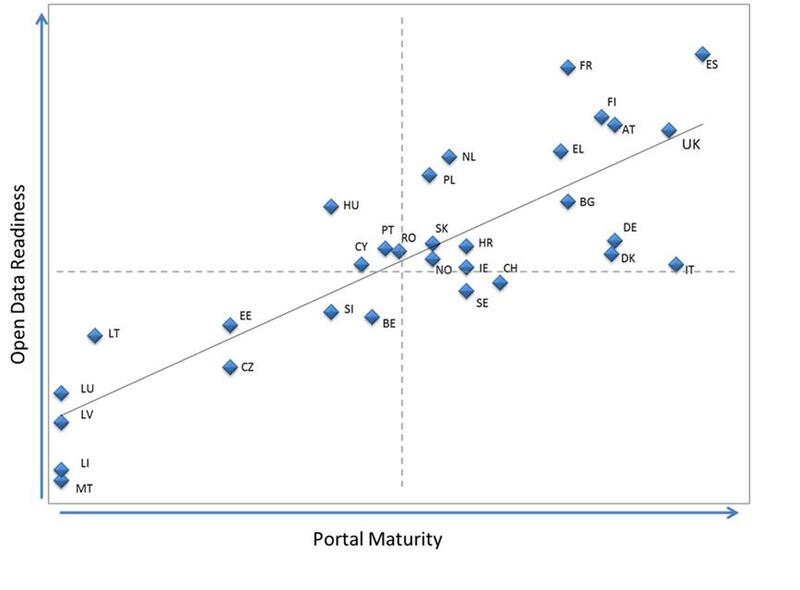 The assessment of the level of Open Data Maturity for each European country is measured by two main categories. Open Data Readiness examines existing policy, licensing norms, the impact of Open Data, the usage of these data and the level of coordination at a national level. 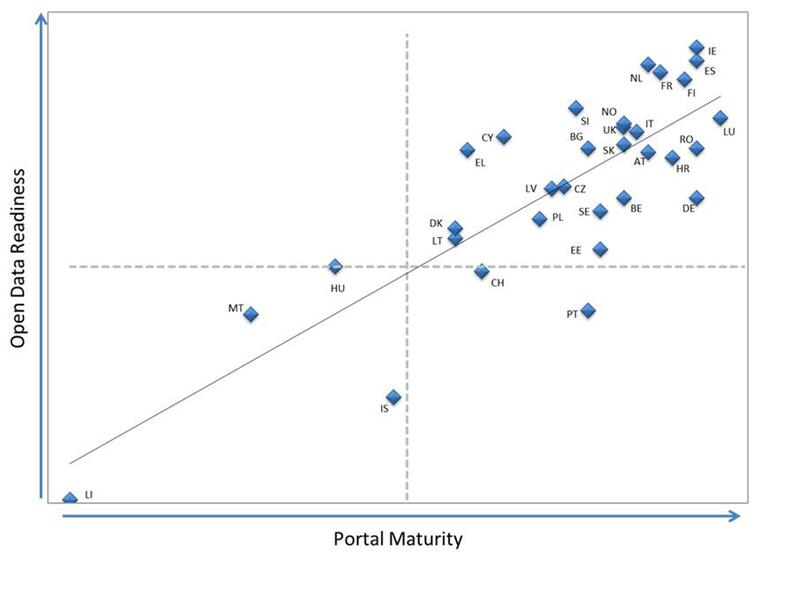 Portal Maturity focuses on the characteristics of each Member State’s national data portal(s), such as their usability, the reusability of the data and the spread across domains. Within each of these rubrics, a range of Key Performance Indicators (KPIs) are assessed. 42 The following illustration shows that the past three years have seen improvements across all measures. Source: European Commission on the basis of the European Data Portal Dashboard 43 . Based on available evidence, it appears that the Directive has been largely effective in meeting the objectives specified in Section 2, although there are areas that require further work. The analysis below is based on the comparison between the objectives and the extent to which they have been achieved after the implementation of the provisions. The PSI Directive has been very effective in ensuring that competition is not distorted, although there is still ground for improvement as regards specific issues. In terms of overall functioning of the PSI market, stakeholders agree on the positive effect the PSI Directive has had in harmonising practices and providing stability for data providers and re-users. 46 It has helped to lay down a level playing field for all stakeholders and clarified rules and approaches for both data providers and re-users. 47 An example of such a positive impact can be identified with respect to the use of “exclusive agreements” for re-use. If the rules on exclusive agreements helped in reaching the objective of ensuring fair, proportionate and non-discriminatory conditions for PSI re-use, some challenges related to these practices still remain. The results of the online public consultation indicate that many respondents are not sure about the current situation. Only 38% (73 of 193 respondents) agree that exclusive agreements between public sector bodies and third parties are used only exceptionally and are strictly limited to the cases mentioned in the Directive (e.g. necessary for the provision of the public service). This shows that despite significant progress, some further actions may be needed to curb the practice of exclusive agreements. Also, rather than formal exclusivity agreements, some stakeholders have raised the issue of PSI data lock-in as regards certain datasets. 50 Cases of PSI data lock-in might happen in a number of different situations 51 , but what they all have in common is the fact that there is no formal willingness on the side of the public authority to establish a formal exclusivity agreement between parties. The PSI Directive has significantly contributed to maximizing the benefits of the PSI market in Europe, both in terms of the development of new services and the creation of new jobs, and there is ample evidence to substantiate this claim. In the replies to the online public consultation 81% respondents (157 of 194) agree that more data held by public sector bodies, including cultural heritage institutions, has become available for re-use, and as many as 73% (140 of 193 respondents) agree that PSI is increasingly becoming a source of innovative services and products. More than half of the respondents (54%) also agree that PSI has become more affordable, including for start-ups and SMEs. On a more granular level, the effectiveness of the PSI Directive with respect to the objective mentioned above should be measured both in terms of impact on the supply side (availability of more PSI for the data market) and demand side (number of services and products developed as a consequence of the availability of data). Regarding the supply side there has been a constant process of monitoring the open data maturity and readiness of the EU Member States coming from different initiatives: the European Data Portal 52 , the Open Knowledge Foundation 53 , and the Global Open Data Index 54 etc. 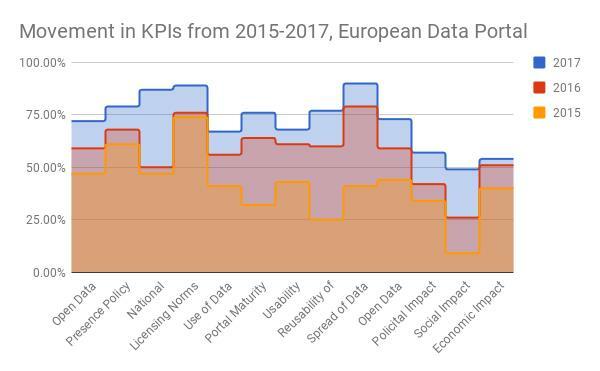 The data collected as part of this research suggest that the availability of public sector data in Europe has increasingly improved over time together with the quality of the open data initiatives. Next to the improved Open Data Maturity in the EU28, the number of datasets available on the local, regional, national and European portals have been constantly increasing over time. For instance, the statistics for both the European Data Portal (giving direct access to datasets from all the Member States at different levels of government) and Europeana (giving access to information from cultural institutions) showed a steady increase in the supply of PSI. 55 Similarly, statistics from open data portals at the local, regional and national level confirm this trend. Therefore, as all this evidence points out, on the supply side of PSI there has been a constant improvement over time in terms of the number of datasets available and open data maturity of European countries. Although it cannot be taken for granted that this trend is the sole result of the PSI Directive, these data suggest that the Directive has definitely contributed to improving the supply market side of PSI in Europe and to making Europe one of the most advanced open data economies in the world. Source: Impact Assessment Support Study, Deloitte, 2018. As regards the number of jobs created thanks to PSI re-use, the total number of persons employed in the EU28 has increased slowly but steadily during the last years according to Eurostat. The number of persons employed in areas of knowledge-intensive activities 58 has developed similarly. Thus, it can be inferred that the number of citizens employed in jobs relating to PSI has increased similarly from 2010 to 2017, albeit at a slightly higher growth rate. It is estimated that around 20,000 persons are employed in jobs directly relating to PSI today. 59 The number of persons indirectly employed depending on PSI is, however, approximately 3.5 times higher. Transmetrics 60 solution provides cargo companies with an accurate demand forecast and network optimisation based on Big Data and predictive analytics. This limits the empty space within cargo vehicles. Transmetrics uses various types of Open Data from public sector bodies for their analyses, e.g. infrastructural data, traffic information, road conditions, customs declarations. Since 2013 Transmetrics has grown from 4 co-founders to a team of 19 highly skilled part- and full-time employees, received many international awards, including Forbes Business Awards, and signed the contract with its first official customer in 2015. Currently, the team is working with several other world-known cargo companies. The PSI Directive has also played a part in facilitating cross border re-use of data, although progress in this area could still be improved. This is shown very clearly in the replies to the online public consultation, in which only 34 % (66 of 192 respondents) feel that PSI circulates freely across the EU and that cross-border applications based on such information are easy to implement. Another interesting aspect that can be analysed in this context is the general reusability of data within and across borders. As measured by a recent report 62 , it seems to be constantly improving. The improvements in the reusability scores are driven by increased adoption of Application Programming Interfaces (APIs) and the improving availability of machine-readable datasets. According to other international sources 63 , while 98% of businesses seem to use primarily data deriving from national sources, about 48% of businesses also use data from international sources. At the same time, the use of information obtained from international sources has risen over the past years. In some cases, the use of international sources is due to the lack of availability of national data that, nonetheless, is available through international organisations. It is to be noted that the European Commission seems to be the principal international community source for many of the companies across Europe when it comes to open data. The changes to charging provisions were driven by the objective of lowering barriers for re-users of data (and especially start-ups, SMEs and citizens who might be more sensitive to costs) and increasing the exploitation of PSI overall. There is some evidence on the extent to which the changes in the charging practices have been effective and have achieved the abovementioned objectives, although it is limited since the transposition of the Directive is recent. Concerning the data format provisions, the PSI Directive introduced in 2013 a more explicit definition of "electronic means" by adding and defining the terms "machine-readable format", "open format", "formal open standard" and "metadata". Thus, paragraph 1 of Article 5 recommends now that "public sector bodies shall make their documents available in any pre-existing format or language, and, where possible and appropriate, in open and machine-readable format together with their metadata. Both the format and the metadata should, in so far as possible, comply with formal open standards." With the growing importance of dynamic data, the insufficient use of APIs is regularly recognized as one of the main barriers for data re-use. This was for instance emphasized in the Commission's 2017 public consultation on "Building a European data economy initiative" where the summary report noted that 68% of respondents clearly support an increased use of APIs. 71 This problem was not dealt with explicitly by the 2013 changes to the directive, although it was addressed in the guidelines. Some open data professionals 72 also warn that there is still a lot to be done for non-dynamic datasets, in particular key datasets, where the lack of machine-readability is blocking or greatly limiting the re-use of data. An additional area of improvement would be to provide high value datasets published with common more harmonised data models in the same level of granularity or scale in each Member State. The assessment of the findings available suggests that the PSI Directive has been overall effective in achieving its objectives. The analysed evidence indicates that the Directive has ensured fairer competition in the Digital Single Market, enabled the creation of new jobs and services and, to a lesser extent, enhanced an effective cross-border use of PSI by businesses. Data also suggests that the Directive has not yet reached its full potential and that a few (and sometimes new) challenges exist, such as PSI data lock-in. Moreover, although only a limited period of time has passed since the implementation deadline, early signs clearly indicate that the 2013 changes have been effective, particularly as regards charging and data formats. The analysis of the findings on the efficiency of the Directive points to the conclusion that there is a positive balance between the costs and its benefits, and therefore it can be seen as efficient. The overall benefits brought by the PSI Directive fall into two categories: economic and societal. Medicatio 83 is a website that seeks to publish data on all available drugs in France, and in doing so it aims to improve medical information and dialogue among doctors, pharmacists and patients, as well as addressing the growing problem linked to overconsumption of drugs. It captures Open Data from multiple French ministries and agencies, and it has already won several prizes. ·Direct costs (compliance and administrative costs): Compliance costs encompass investments and expenses needed to comply with substantive obligations contained in the Directive (this also includes technical costs needed to make the data technically reusable, such cleaning up of datasets, maintenance of portals, API costs, software costs etc.). Administrative costs are the costs borne by public sector bodies as a result of administrative activities performed to comply with the obligations (e.g. time and resources spent in figuring out licensing and license related costs, personnel training, communication activities, developing guidelines etc.). ·Enforcement costs. These costs are associated with activities linked to the implementation of the Directive, such as information and monitoring, complaint handling and adjudication. In the following figure, the annual economic benefits of opening PSI are compared with the overall annual costs of opening PSI. 88 The economic benefits of opening PSI are around 240 billion EUR today, whereas the costs associated with opening PSI are around 9 billion EUR. It is believed that the 2013 revision of the Directive has triggered a decrease in overall costs of making PSI available. It can be concluded that the benefit-cost ratio is roughly 26:1 today, meaning that the benefits of PSI today are 26 times greater than its costs. Considering only the direct economic value of PSI, the benefit-cost ratio is approximately 5:1 today. However, as regards the redress mechanisms, as many as 44% of respondents to the online public consultation agree that in case a request for re-use is rejected and an applicant decides to appeal against the decision of a public sector body, the redress procedure at the national level is slow and inefficient, and it can be very costly. It should be noted that the 2011 Commission proposal for revising the Directive addressed this issue, but that the relevant provision was significantly watered down in the interinstitutional process. The evidence indicates that the changes in the rules concerning charging and data format have been efficient. There is consensus among stakeholders (both from re-users and public sector bodies) that charging at marginal costs 90 or below is efficient when looking at the balance between the overall benefits for the society and the related costs. The machinery behind a charging system (e.g. accounting, marketing) is costly and a large part of the income of public sector bodies charging beyond marginal costs comes from other public sector bodies. When trying to look more closely at efficiency gains from the 2013 data format provisions, it is difficult to provide an average breakdown of costs as both the existing data infrastructures already in place, and the technical choices will have an important impact on the final figure. 91 The issue of interoperability is becoming more and more relevant to address, in particular as more high value datasets are made available online. This has been evidenced in several recent communications such as those from the Open Data Institute 92 and Open Knowledge International 93 , which consider it to be one of the main issues to tackle in order to progress towards a higher impact from open data. In this context it is interesting to recall again the Danish Basic Data Programme, which aims to establish a system of shared key registers through the implementation of the "once only" principle that comes with interoperability standards and APIs for data exchange. It has been estimated that the total impact of the Danish Basic Data Programme, if applied to all Member States, would amount to more than 5 billion EUR (net revenues for both public and private sectors), once fully deployed. The very high estimated impact for the whole EU is also due to the fact that those key registers are made freely accessible to users (open data) in high quality and with the right data formats and means of distribution (those required by the users). There are no indications that the PSI Directive creates a disproportionate administrative burden on public authorities. 57% of respondents in the public online consultation find that the provisions of the PSI Directive are easy to understand and implement by public sector bodies and re-users alike. However, some stakeholders have indicated that understanding the interplay between the PSI Directive and other related legal instruments (e.g. the Database Directive) requires a high level of expertise, and in this context clarification of this interplay would help in reducing the administrative burden. Apart from the issue mentioned above, the burden mainly concerns public sector bodies and consists of the costs of coordination, service implementation relating to processing requests to make data available for re-use and compliance with transparency requirements. Despite these requirements, the burden does not appear to be excessive. For example, according to a Dutch study commissioned by the Association of Dutch municipalities (VNG) 96 , the implementation costs of the 2015 national law transposing the PSI Directive (Wet hergebruik overheidsinformatie – Who) do not exceed 2000 EUR per municipality per year. On a more global level, there are also monitoring and reporting obligations under the Directive, but they do not appear to be excessive either. According to feedback from Member States, the elaboration of the most complete report required around 100 man/days, with shorter and more streamlined reports requiring much less time and effort. Another issue raised in the exchanges with Member States is the need to be able to deal efficiently with recurrent unjustified requests from the same requester. More generally, it has also been pointed out that the overall thrust of the Directive is favorable towards reducing administrative burden, because it encourages public sector bodies to proactively make as much PSI available online for re-use as possible, ideally in an automated way. Following this principle means that public sector bodies would be faced with fewer requests and fewer complaints, and the administrative burden and costs related to this would progressively decrease as more and more PSI for re-use becomes available online. The example of the Danish Basic Data Programme mentioned above indicates the financial benefits of this pro-active approach, which has the additional advantage of lowering the cost for re-users in dealing with the administration. The analysis of the findings on the efficiency of the Directive points to the conclusion that there is an overall positive balance between the costs and the (quantitative and qualitative) benefits of this legislation. For the efficiency of the 2013 extension to the cultural institutions, it is too early to draw conclusions. Based on the evidence available, the PSI Directive is still very relevant today because it responds to a large extent to stakeholders’ needs, still fulfills its policy objectives, and addresses the right issues to facilitate re-use. ·data to be provided in a standard, machine readable and re-usable format. The above findings are largely confirmed by data from the online public consultation. 87% of respondents agree that the PSI Directive is still relevant by ensuring the supply of PSI into the EU single market for PSI, with 82% convinced that it ensures sufficient usability (e.g. machine-readability) of data. Furthermore, 87% respondents agree that the Directive ensures fair market access (non-discrimination) for all re-users and 85% believe that it ensures transparency and accountability of public sector bodies. ·the scope of the Directive, which does not include a number of valuable datasets, such as for instance research data and data held by public undertakings in utility domains (energy, transport, waste etc.). Some Member States are legislating in these areas in view of making more data of public interest available, while others are not, which risks creating an uneven playing field across the EU. ·the lack of a clear direction concerning dynamic data and APIs. The 2013 rules concerning machine-readable and reusable format already facilitate the re-use of data, but these provisions are not sufficient anymore in a world in which data have become much more frequently re-used in real time. To extract value from such PSI it is imperative that public sector bodies make it available in automated ways, ideally via APIs. As for changes concerning charging, Member States confirmed that charging at zero or marginal costs is the new norm for the vast majority of public sector bodies. However, all Member States still use the exceptions to the marginal costs regime, even beyond the cultural sector that was brought into the Directive in 2013 under the more generous 2003 charging rules, which allow public sector bodies to charge above the marginal cost. Although it is generally acknowledged that lowering the costs for re-use of datasets can overall benefit the economy and society, public sector bodies charging beyond marginal costs of dissemination point out that they need the income to reinvest in the quality of their datasets: Open Data leads to higher tax income and to benefits throughout the public sector and the economy, but if the public sector bodies producing the data do not get the appropriate funding for maintaining the datasets, the overall quality and usability of the data will be at risk. The evidence suggests that since its adoption, the PSI Directive has retained its relevance to stakeholders’ needs. However, emerging trends such as the increase in dynamic data coming from sensors and IoT devices, and Member States actions in making data of public interest better available in new areas not covered by the Directive (e.g. public undertakings in transport and utility domains) might have an impact on its relevance for the future. By and large, there is agreement among stakeholders that the Directive is largely coherent with the related legislation, although in the case of some instruments it would benefit from a degree of clarification. The INSPIRE Directive establishes a legal and technical interoperability framework for the sharing (access and use) of spatial data 109 held by public authorities for the purpose of environmental policies and policies and activities having an impact on the environment. Spatial data are amongst the most valuable datasets 110 for both public re-use (to establish the environmental impact of policy measures, to adopt emergency plans in case of natural disaster) and for private re-use (for geo-localisation services for instance, for mobility and energy apps etc.) . 111 This is one of the reasons why spatial information is covered by both the PSI Directive and the INSPIRE Directive. While the latter focuses technically on data access services, interoperability models and mandatory data-sharing between administrations, the former regulates the re-use of spatial datasets, including the conditions for re-use by third parties. From this perspective, the complementarity and coherence of the two Directives have played out well. However, for the future and due to the 2013 modifications of the PSI Directive, a few risks in terms of coherence could be identified, in particular as regards re-use conditions (e.g. charging and licencing). Some stakeholders argued that more guidance is needed to understand what is allowed for spatial data and services. It was noted that, in some cases, agencies managing spatial data are “borderline” in terms of compliance with the PSI Directive. 113 Moreover, it was mentioned that issues related to interoperability of metadata could arise if the two communities (PSI and INSPIRE) do not coordinate sufficiently with each other: indeed, the INSPIRE metadata standard is a thematic extension 114 of CKAN 115 used by the PSI community. Besides these limited issues, which would benefit from some clarification, the coherence between the INSPIRE and the PSI Directives is confirmed in the results of the online consultation. Only 11% of respondents do not think that the PSI and INSPIRE Directives are well aligned. Almost a half of respondents (44%) believe that there are no problems in this area, while 45% do not have an opinion. Information produced by the public sector often does not contain personal data (maps, meteorological information etc.). However, there are numerous cases in which PSI may contain personal data. Therefore the protection of personal data is an important aspect of handling PSI: data protection legislation shall be respected in such cases. This means that PSI law must be applied in full compliance with data protection law and that it does not create any exceptions to it – this is explicitly recognised by the current PSI Directive. Indeed, according to Article 1(4) “This Directive leaves intact and in no way affects the level of protection of individuals with regard to the processing of personal data under the provisions of Union and national law, and in particular does not alter the obligations and rights set out in Directive 95/46/EC”. This is reinforced in recital (11) of Directive 2013/37/EU, stating that it “should be implemented and applied in full compliance with the principles relating to the protection of personal data in accordance with Directive 95/46/EC of the European Parliament and of the Council of 24 October 1995 on the protection of individuals with regard to the processing of personal data and on the free movement of such data”. In 2013 the Article 29 Working Party has provided an opinion on the application of data protection law in the context of PSI. 116 The objective of this opinion was to help ensure a common understanding of the applicable legal framework, and offer consistent guidance and best practice examples on how to implement the PSI Directive (as amended) with regard to the processing of personal data. The current Directive 95/46/EC will be repealed and replaced by the General Data Protection Regulation (GDPR) 117 on 25 May 2018. This new data protection framework has been built on the existing legislation. The recital 154 of the GDPR states that “Directive 2003/98/EC of the European Parliament and of the Council leaves intact and in no way affects the level of protection of natural persons with regard to the processing of personal data under the provisions of Union and Member State law, and in particular does not alter the obligations and rights set out in this Regulation.” Moreover, Article 86 of the GDPR contains a specific provision on processing and public access to official documents. During the engagement with stakeholders some targeted challenges were raised by public sector bodies, for example about the use of appropriate techniques for pseudonomisation or anomysation in order to reconcile the provisions on the re-use of PSI with the right to the protection of personal data. This issue is, however, not specific for the PSI area. However, the stakeholders did not recognise during the public consultation any general issues related to the application of the PSI Directive and the legislation on the protection of personal data. Only 27% of respondents do not agree that the PSI Directive is well aligned with the current and future rules on the protection of personal data. The remainder are convinced that there are no issues in this area or do not have an opinion. The relationship between data protection law and PSI re-use – in the sense that both the public sector body and the re-user must comply with data protection law in full - is an established part of Union law. In practice, since the sui generis right, as all exclusive rights in the area of IPR, gives the right holder the capacity to authorise or refuse uses of its protected content, public bodies have sometimes argued that database protected content was not subject to the re-use obligations set out in the PSI Directive. In the absence of a clear provision regulating the relationship between the two instruments, this has created a situation where, in practice, public bodies may invoke (in some cases they have done so) the sui generis right to escape the application of the rules of the PSI Directive. This excludes the case where a database which is used by a public sector body in the course of its tasks was in fact created by a third party. The PSI Directive contains recitals 123 that aim to provide clarity on the relationship between IPRs and the obligations under the PSI Directive. However, in practice legal certainty has not been achieved, at least as regards the interplay between the obligations under the PSI Directive and the sui generis database right held by public bodies. Case law suggests that such uncertain reading of recitals might be at play in practice. Also, in a French court case a judge decided that local authorities were allowed to deny the re-use of genealogy data to a website based on its sui generis right. This judgement was overturned by the Conseil d'Etat 124 deciding that the sui generis right cannot prevent the re-use of data under the rules of the PSI directive. Also, in a 2012 judgment of the Court of Justice of the European Union, the Austrian state asserted sui generis right in the official companies register in an attempt to deny its re-use by private company. While this last case was not specifically about PSI but competition law 125 , the case also highlights the uncertainty surrounding the applicability of the sui generis database right in cases of public data re-use. Moreover, various instances were reported by practitioners where access and re-use of public information such as population census data or official map and traffic data were prevented by authorities exercising their sui generis right. 126 As a result, even if courts resolve the conflict of the directives to the advatange of the public information re-users, the transaction cost of litigation is a relevant factor to take into account. The misalignment is to some extent confirmed by the results of the online public consultation, in which 34% of respondents agreed that the PSI and Database Directives are well aligned, while 30% disagreed and 46% did not express any particular view. This trend is confirmed by the public consultation on the Database Directive 127 where 29.8% of the respondent stakeholders agree that the Database Directive and the PSI Directive are not coherent legislation, while 31.5% agree that they are and 38.5% of the respondents did not express an opinion. The obligations of the PSI Directive build on the national access regimes, which can limit access to certain documents on the grounds on national security, commercial confidentiality etc. These access regimes are often not completely aligned. This has an impact on the availability of the information for re-use, since information that is not generally accessible in a Member State is not covered by the Directive. Nevertheless, the replies to the public consultation indicate that overall the PSI Directive is coherent with these regimes. Almost 72% of respondents agree with this statement or do not hold a specific view, while only 28% believe that there is lack of coherence between the PSI Directive and national access regimes that would be problematic. When discussing the PSI Directive and the main barriers for the re-use rule, stakeholders often mention the question of the barriers raised by the exception concerning third party copyright. However, in terms of legal clarity there is no particular inconsistency between PSI and copyright rules as the relation between the two regimes is transparent. Still, for the implementation of the Directive copyright raises a number of challenges, in particular due to different rules in Member States (for example in terms of the rights of individual public sector employees) and the burden of copyright clearance. As regards the extension of the scope to cultural data, there is a high level of coherence of the PSI Directive with the international framework of reference. Indeed, the PSI Directive provisions pursue objectives which are totally in line with those of UNESCO. In fact, they go even further in promoting accessibility and re-use of cultural information. Some challenges were identified with regard to the copyright framework and in particular the Directive on orphan works. 132 Some stakeholders see the latter as too complicated and not necessarily consistent with the objectives of the PSI Directive in the area of cultural data. 133 Indeed, the Directive on orphan works provides that “diligent search” is performed to clear the information/data on a specific orphan work 134 for re-use. However, this diligent search is interpreted differently in different Member States and this might result in uneven opening up and re-using of similar cultural data. As regards the coherence of the 2013 changes concerning the charging provisions, the above mentioned issue on the relation with the INSPIRE Directive is relevant. Theoretically, these two regimes are perfectly complementary, as they have different purposes. Nevertheless, the question of the coherence between the INSPIRE Directive and the charging provisions of the PSI Directive has been raised by some stakeholders, so it might benefit from some clarification or formal alignment. The PSI Directive is overall coherent with other relevant EU legislation. Nevertheless a technical clarification confirming the relation with in particular the Database Directive and the INSPIRE Directive may be useful. In relation with data protection legislation the interaction is already very clear, in that the rules on re-use must be applied in full compliance with data protection legislation. The PSI Directive is based on Article 114 of the Treaty on the Functioning of the European Union (TFUE) 135 and therefore strongly rooted in a Single Market logic. Based on the feedback received by stakeholders, the EU added value of the Directive is unquestioned. The stakeholders tend to agree that national initiatives in the field of PSI would have not been sufficient to address possible market distortions and market failures and to offer a level-playing field to all businesses. 136 The instrument has helped to reduce the significant differences that existed between Member States. Replies to the online consultation support this claim. 87% of respondents agree that the PSI Directive has played a role in encouraging the national authorities to open up more public sector data, while almost 63% believe that it has facilitated access to PSI from countries other than the one where the person concerned lives. Similarly, almost 64% of the replies indicate that the PSI Directive has been conducive to the creation of an EU-wide market for products and services based on PSI, with less than 20% disagreeing. Stakeholders 137 agreed on the high EU added value of the modifications brought in 2013 to the provisions on charging. National initiatives alone would not have been able to provide a level-playing field for all European re-users and public sector bodies with respect to the price of data. Although some stakeholders expressed doubts regarding the capacity to streamline open data standards through a top-down approach, others underlined that the direction given by the EU in the Directive, and its concretisation in the 2014 guidelines on data formats, have brought some EU added value. Analysis and stakeholder views confirm that policy intervention at the Member States level could not have achieved the same results to the same extent as the PSI Directive. The overall EU added value of the instrument is unquestioned, although it is stronger for specific aspects of PSI re-use (charging) than for others (cultural data and formats). 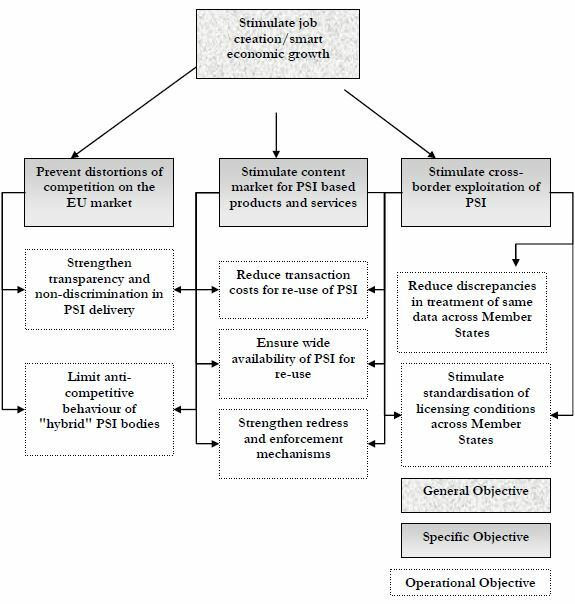 Evaluation of the PSI Directive, including the changes introduced in 2013, has shown that it continues to be an effective, efficient and relevant instrument that successfully contributes to the achievement of its main policy objectives, which are to stimulate the digital content market for PSI-based products and services, to stimulate cross-border exploitation of PSI and to prevent distortions of competition on the EU market. It has also been demonstrated that the PSI Directive does not impose a disproportionate burden on the stakeholders concerned. While it affects two groups of stakeholders: re-users (mostly from the private sector, including SMEs, micro enterprises and start-ups) and public sector bodies, it only imposes obligations (and possible resulting administrative burden) on the latter. It should also be borne in mind, however, that several obligations that the PSI Directive imposes on public sector bodies, notably those related to the practical arrangements of making data available, should be considered as part of an overall effort towards digitising administration 140 rather than specific PSI Directive-related costs. Re-users, on the other hand, have benefited from the substantial simplification of the procedures for obtaining PSI access, which helps them save time and resources. However, the evaluation has also revealed that there are a number of areas that would need to be addressed in order to fully exploit the potential of PSI for the European economy and society. First, recent technological progress has allowed public sector bodies to generate a wealth of dynamic datasets. Nevertheless, as shown in the evaluation, the provision of real-time access to such data via adequate technical means, such as APIs, and in conformity with recognised interoperable standards, is still an issue which limits the usefulness of such data for innovative and high-demand services. Second, while the Directive has definitely contributed to an increased supply of public sector data in the internal market, there are still vast amounts of high-value public data that remain shielded from its scope, such as research data or data from entities executing public sector tasks. Some Member States are moving faster and taking action to address this issue, but others are not. Third, the evaluation has shown that although the competition dimension of the PSI Directive works, there are some concerns as regards the continued existence of exclusive arrangements. These may take new forms, such as PSI data lock-in, leading to situations in which the re-use of data by one economic operator takes away the incentive for commercial re-use of the same dataset by other companies. Fourth, the Directive would benefit from some additional clarification as regards charging provisions. The evaluation has revealed that exceptions enabling public bodies to charge above the default upper limit of marginal cost of dissemination are less relevant than before. Finally, it has been observed that while the PSI Directive is coherent with the current legislation on related topics, its interaction with certain legal instruments could be clarified. This concerns the relation between the PSI Directive and the Database Directive and the relation between the PSI and INSPIRE Directives, in particular as regards charging mechanisms. Addressing the above challenges will ensure that the Directive will remain an effective, efficient and relevant policy measure with an even greater potential to generate EU added value for the European taxpayer. ·Has the Directive ensured that competition in the internal market is not distorted? ·Has the Directive enabled the creation of jobs related to the digital economy and concerning digital contents? ·Have more data held by public sector bodies, including cultural heritage institutions, become available for re-use? ·Has PSI increasingly become a source of innovative services and products? ·Is PSI circulating freely across the EU and are cross-border applications based on such information easy to implement? ·Has PSI has become more affordable, including for start-ups and SMEs? ·Are exclusive agreements between public sector bodies and third parties used only exceptionally and are they strictly limited to the cases mentioned in the Directive (e.g. necessary for the provision of the public service)? ·What ratio exists between the benefits achieved and the costs borne by the stakeholders concerned? ·Are the costs borne by the public sector bodies in implementing the Directive (e.g. adapting IT infrastructure, lower income from charges) offset by socioeconomic benefits of re-using data (e.g. creation of new digital applications and products, increased transparency)? ·Does compliance with the Directive require better data management processes of public institutions? Does this lead to cost savings and increased operational efficiency? ·In case a request for re-use is rejected and an applicant decides to appeal to the decision of public sector body, is the redress procedure swift, efficient and without excessive costs? ·To what extent is the overall Directive still relevant in 2017, 14 years after its first adoption and based on any possible evolution of stakeholders’ needs in the meantime? ·Is the PSI Directive still relevant by ensuring the supply of PSI into the EU single market for PSI? ·Is the PSI Directive still relevant by ensuring sufficient usability (e.g. machine-readability) of data? ·Is the PSI Directive still relevant by ensuring fair market access (non-discrimination) of all re-users? ·Is the PSI Directive still relevant by ensuring transparency and accountability of public sector bodies? ·Is the PSI Directive well aligned with and complementary to EU legislation on the protection of personal data? ·Is the PSI Directive well aligned with and complementary to the rules based on the INSPIRE Directive? ·Is the PSI Directive well aligned with and complementary to the rules based on the PAEI Directive? ·Is the PSI Directive well aligned with and complementary to the rules based on the Database Directive? ·Is the PSI Directive well aligned with and complementary to the rules based on national access regimes (rules which limit access to certain documents on the grounds of national security, commercial confidentiality, etc.)? ·Is the PSI Directive well aligned with and complementary to the EU copyright rules? ·Has the PSI Directive played a role in encouraging the national authorities to open up more public sector data? ·Has the PSI Directive facilitated access to PSI from countries other than the one where the person concerned lives? ·Is the PSI Directive conducive to the creation of an EU-wide market for products and services based on PSI? AI - Artificial Intelligence, intelligence displayed by machines, applied when a machine mimics cognitive functions that humans associate with other human minds, such as learning and problem solving. API (Application Programming Interface) - a set of technical protocols by means of which one piece of software asks another programme to perform a service. The service could be granting access to data or performing a specified function. Database Directive - Directive 96/9/EC of the European Parliament and of the Council of 11 March 1996 on the legal protection of databases, which harmonizes the treatment of databases under copyright law and introduces the sui generis right for the creators of databases which do not qualify for copyright. PSI data lock-in - arrangements where public sector bodies grant access to their datasets free of charge to one economic operator, for example in exchange for in-kind compensation, leading to a situation in which the re-use of such data by this economic operator would take away the incentive for commercial re-use of the same dataset by other companies. document - any content whatever its medium (written on paper or stored in electronic form or as a sound, visual or audio-visual recording), or any part of such content; synonymous with data. dynamic data - data from sensors (e.g. bus arrival times, meteorological data), whose economic value depends on its real-time availability. European Data Portal - a portal that harvests the metadata of PSI available on public data portals across European countries. Information regarding the provision of data and the benefits of re-using data is also included. formal open standard - a standard which has been laid down in written form, detailing specifications for the requirements on how to ensure software interoperability. high-value datasets - datasets which are particularly valuable assets for the economy and society at large. Access to and the re-use of such datasets can speed up the emergence of value-added information products and services, and also encourage participatory democracy. G8 members have identified 14 high-value areas – from education to transport, and from health to crime and justice – which should help unlock the economic potential of open data, support innovation and provide greater accountability. INSPIRE Directive - Directive 2007/2/EC of the European Parliament and of the Council of 14 March 2007 establishing an Infrastructure for Spatial Information in the European Community , which aims to create a European Union spatial data infrastructure for the purposes of EU environmental policies and policies or activities which may have an impact on the environment. machine-readable format - a file format structured so that software applications can easily identify, recognize and extract specific data, including individual statements of fact, and their internal structure. marginal cost method - a principle applying to all charging for public sector data re-use in the EU, with some exceptions: public sector bodies may charge no more than the marginal cost of reproducing, providing and disseminating the documents. open data - data that is freely available to everyone to access and re-use as they wish, without restrictions from copyright, patents or other mechanisms of control. open format - a file format that is platform-independent and made available to the public without any restriction that impedes the re-use of documents. public undertaking - any undertaking over which the contracting authorities may exercise directly or indirectly a dominant influence by virtue of their ownership of it, their financial participation therein, or the rules which govern it. public sector body - a state, regional or local authority, a body governed by public law or an association formed by one or several such authorities or one or several such bodies governed by public law. re-use - the use by persons or legal entities of documents held by public sector bodies, for commercial or non-commercial purposes other than the initial purpose within the public task for which the documents were produced. sui generis database right - a sui generis database right is a property right, comparable to but distinct from copyright, that exists to recognise the investment that is made into compiling a database, even when this does not involve the creative aspect that is reflected by copyright. It is sometimes invoked by public sector bodies to justify their refusal to give access to their data. (1)Merijn Backx, Gebouwgegevens redden levens. Toegankelijkheidseisen van gebouwgegevens in het kader van de openbare orde en veiligheid (scriptie Technische Universiteit Delft), 2003. BDO 199. (2)Bregt, A., L. Grus & D. Eertink (2014). Wat zijn de effecten van een open basisregistratie topografie na twee jaar?,Wageningen University: p. 49. (12)Grus, L., A. Bregt & D. Eertink (2015). De effecten van open data BRT na 3 jaar, Wageningen University & het Kadaster: 7. (14)Harrison, T., & Sayogo, D “Transparency, participation and accountability practices in open government: A comparative study”. Government Information Quarterly, 2014, 31, pp. 513–525. (16)Katleen Janssen, “The influence of the PSI directive on open government data: An overview of recent developments”, Government Information Quarterly, Volume 28, Issue 4, October 2011, pp. 446-456. (24)Ruijer , Grimmelikhuijsen, Meijer, Open data for democracy: Developing a theoretical framework for open data use, Government Information Quarterly, Volume 34, Issue 1, January 2017. (1) The Regulatory Fitness and Performance Programme (REFIT) is the Commission's programme for ensuring that EU legislation remains fit for purpose and delivers the results intended by EU law makers. (2) Directive 2003/98/EC of the European Parliament and of the Council of 17 November 2003 on the re-use of public sector information, as amended by Directive 2013/37/EU of the European Parliament and of the Council of 26 June 2013. (7) Proposal for a Directive of the European Parliament and of the Council Amending Directive 2003/98/EC on re-use of public sector information, COM/2011/0877 final - 2011/0430 (COD), http://eur-lex.europa.eu/legal-content/en/TXT/?uri=CELEX%3A52011PC0877 . (8) European Commission, “Guidelines for improving the synergy between the public and private sectors in the information market”, 1989, ftp://ftp.cordis.lu/pub/econtent/ docs/1989 public sector guidelines en.pdf. (9) European Commission, “Public sector information: A key resource for Europe. Brussels: European Commission”, 1998 Report COM(98) 585 final, http://europa.eu.int/ISPO/docs/policy/ docs/COM(98)585/. (10) Directive 2013/37/EU of the European Parliament and of the Council of 26 June 2013 amending Directive 2003/98/EC on the re-use of public sector information, http://eur-lex.europa.eu/legal-content/EN/ALL/?uri=CELEX:32013L0037 . (11) Communication from the Commission to the European Parliament, the Council, the European Economic and Social Committee and the Committee of the Regions A Digital Agenda for Europe/* COM/2010/0245 final, http://eur-lex.europa.eu/legal-content/EN/TXT/?uri=celex:52010DC0245 . (12) EUROPE 2020 A strategy for smart, sustainable and inclusive growth, COM/2010/2020 final, http://eur-lex.europa.eu/legal-content/en/TXT/?uri=celex:52010DC2020 . (13) One of the key tools for monitoring these indicators are the annual Open Data Maturity reports available on the European Data Portal (see also point 3 below), https://www.europeandataportal.eu/en/dashboard#2017 . (14) European Commission, Guidelines on recommended standard licenses, datasets and charging for the re-use of documents, 2014: https://ec.europa.eu/digital-single-market/en/news/commission-notice-guidelines-recommended-standard-licences-datasets-and-charging-re-use . (15) https://ec.europa.eu/info/research-and-innovation_en and http://ec.europa.eu/programmes/horizon2020/en/what-horizon-2020 . (16) Deloitte, Open Evidence, Wik Consult, Time Lex, Spark, Lisbon Council think tank for the 21st century. (18) European Parliament, DG JUST, DG CNECT, DG GROW, DG COMP, Publication Office, DG ENER, DG MOVE, DG RTD, JRC, EDPS, EuDECo, Europeana, Kennisland, European University Association. (19) Interviews were conducted with the following types of stakeholders: • ministries and public bodies in charge of public sector data regulation and monitoring of implementation;• public bodies falling into the scope of the directive;• museums, libraries and archives;• public undertakings in utility domains;• universities and research centres; • re-users associations. (22) The European Data Portal is developed by the European Commission with the support of a consortium led by Capgemini, including INTRASOFT International, Fraunhofer Fokus, con terra, Sogeti, the Open Data Institute, Time.Lex and the University of Southampton. (23) Art. 13.2 of the PSI Directive stipulates that "Member States shall submit a report every 3 years to the Commission on the availability of public sector information for re-use and the conditions under which it is made available and the redress practices." (24) These consultations are separate and do not include the stakeholder interviews carried out by the external contractor for the above-mentioned study to support the review of the PSI Directive. (25) A summary of all stakeholder consultation activities can be found in Annex 2 to the Impact Assessment on policy options for the future of the PSI Directive. (28) E3PO consists of national, European and international federations, representing sectoral and pluri-sectoral private companies that are active in the operation of Services of General Economic Interest (SGEI) under contract concluded with public authorities following a competitive bid in the following sectors: motorways, water and sanitation, waste management, energy efficiency, public transport, catering. (32) Directive 2013/37/EU of the European Parliament and of the Council of 26 June 2013 amending Directive 2003/98/EC on the re-use of public sector information. (35) Loi Pour une République numérique (Loi Lemaire), https://www.legifrance.gouv.fr/affichLoiPubliee.do?idDocument=JORFDOLE000031589829&type=general&legislature=14 . (36) Act on Transport Services, https://www.lvm.fi/documents/20181/937315/Factsheet+57-2017+Act+on+Transport+Services.pdf/bd002762-a6a0-4867-bb49-5c1b86069380 . (37) European Data Market Study, SMART 2013/0063, Final Report, IDC, Open Evidence, 2017, https://a2528ba5-a-c3c32646-s-sites.googlegroups.com/a/open-evidence.com/download/repository/SMART20130063_Final%20Report_030417_2.pdf?attachauth=ANoY7cpcDWFe5A8Sjp5mUlWmg4zXgvNf3W4MP144z3qNH26vy7kegeGO2yfvlHUu4QdijKdQoZzs25EN-1vIjdOyJgOiLzd72yZMh2tEX1QOUgWCUupJ3rburRjtWEQljXUnyLw5NoSU04bzNxjeWo4rsVL4kiVIPdfHrD_OnaMVs1zxZJkKZna29Pyfbj1MYXDsuRax_aRdTkECmMWB0kx43yCBM6CakPzkCz0sFHG75tE93VpnML_ed053nmYP1fS_nfY8IA2l&attredirects=0 . (39) D6.3 Business models, lessons learned and success stories, ODINE, p. 40, https://opendataincubator.eu/files/2016/01/D6.3-Final.pdf . (41) Open Data Maturity in Europe, Open Data for a European Data Economy, European Data Portal, 2017, https://www.europeandataportal.eu/sites/default/files/edp_landscaping_insight_report_n3_2017.pdf . (42) The full list of KPIs is available on p.107-109 of the 2017 report on Open Data Maturity in Europe, available on www.europeandataportal.eu/ . (44) Open Data Maturity in Europe 2017, Open Data for a European Data Economy, European Data Portal, 2017, https://www.europeandataportal.eu/sites/default/files/edp_landscaping_insight_report_n3_2017.pdf . (45) Another indication of this trend is the growing availability of Open Data on the European Data Portal, which currently gives access to over 800,000 datasets covering a wide range of sectors. (48) Impact Assessment Support Study, Deloitte, SMART 2017/0061. (49) Minutes of the Member States PSI working group, 10 November 2017, unpublished document. (51) For example when the costs for certain datasets create a market barrier for certain players (e.g. in Belgium only two re-users have full access to business registers data as these cost more than EUR 75,000 per year). (55) Europeana Usage Statistics 2017 – Q2, https://pro.europeana.eu/page/usage-statistics-2017-q2 and evolution of availability of datasets of EDP, https://www.europeandataportal.eu/data/en/statistics/evolution . (56) Direct economic value is the value generated by developing goods and services based on PSI. Indirect economic value refers to the value of goods and services that make use of those PSI-based goods or services. (57) Impact Assessment Support Study, Deloitte, SMART 2017/0061. (58) According to Eurostat, an activity is classified as knowledge intensive if employed tertiary educated persons represent more than 33 % of the total employment in that activity. See: http://ec.europa.eu/eurostat/statistics-explained/index.php/Glossary:Knowledge_Intensive_Activity_(KIA) . (59) Impact Assessment Support Study, Deloitte, SMART 2017/0061. (61) Data drawn from individual country reports compiled annually by the European Data Portal. (62) Open Data Maturity in Europe, 2017, available at https://www.europeandataportal.eu/en/highlights/open-data-maturity-europe-2017 . (63) Estudios de Caracterización del Sector Infomediario, 2014, Red.es, available at http://datos.gob.es/es/documentacion/estudios-de-caracterizacion-del-sector-infomediario-2014 . (64) Impact Assessment Support Study, Deloitte, SMART 2017/0061. (65) Re-use of public sector information act – one year after coming into effect, 2017. Report by the Fundacja ePánstwo and the Centrum Cyfrowe. Available at https://centrumcyfrowe.pl/wp-content/uploads/2017/09/e-1.pdf . (66) Article 7, Directive 2013/37/EU of the European Parliament and the Council of 26 June 2013 amending Directive 2003/98/EC on the re-use of public sector information, see: http://eur-lex.europa.eu/LexUriServ/LexUriServ.do?uri=OJ:L:2013:175:0001:0008:EN:PDF . (67) The new PSI Directive – as good as it seems?, 19 April 2013, Ton Zijlstra and Katleen Janssen, Open Knowledge International Blog, https://blog.okfn.org/2013/04/19/the-new-psi-directive-as-good-as-it-seems/ . (68) Such as the start-ups analysed in the ODINE project https://opendataincubator.eu/files/2017/07/ODINE_Final-report_2.0.pdf . (69) See case studies on the Norwegian METNO case (meteorological data) and case study on the Dutch KNMI case (meteorological data), Study on the Pricing of Public Sector Information – POPSI Study, October 2011, Deloitte, https://ec.europa.eu/digital-single-market/en/news/pricing-public-sector-information-study-popsis-models-supply-and-charging-public-sector . (70) Open Data Maturity in Europe 2017, Open Data for a European Data Economy, European Data Portal, 2017, https://www.europeandataportal.eu/sites/default/files/edp_landscaping_insight_report_n3_2017.pdf . (72) Interview with OpenDataSoft, 13 December 2017. (73) European Data Market Study, SMART 2013/0063, Final Report, IDC, Open Evidence, 2017, https://a2528ba5-a-c3c32646-s-sites.googlegroups.com/a/open-evidence.com/download/repository/SMART20130063_Final%20Report_030417_2.pdf?attachauth=ANoY7cpcDWFe5A8Sjp5mUlWmg4zXgvNf3W4MP144z3qNH26vy7kegeGO2yfvlHUu4QdijKdQoZzs25EN-1vIjdOyJgOiLzd72yZMh2tEX1QOUgWCUupJ3rburRjtWEQljXUnyLw5NoSU04bzNxjeWo4rsVL4kiVIPdfHrD_OnaMVs1zxZJkKZna29Pyfbj1MYXDsuRax_aRdTkECmMWB0kx43yCBM6CakPzkCz0sFHG75tE93VpnML_ed053nmYP1fS_nfY8IA2l&attredirects=0 . (74) Over the past ten years, different studies have raised different expectations as regards the potential value of Open Data. Generally speaking, the majority of studies performed previously are ex-ante estimations. These are mostly established on the basis of surveys or research and provide a wide range of different calculations. Limited comprehensive and detailed ex-post evaluations of the materialised costs and benefits of Open Data are available, and where available, they do not include macro-economic figures but are rather based on an individual organisation. (75) European Data Portal: Analytical Report 9: The Economic Benefits of Open Data, December 2017. (76) European Data Portal: Analytical Report 9: The Economic Benefits of Open Data, December 2017. (77) DECA [Danish Enterprise and Construction Authority] (2010). The value of Danish address data, http://www.adresseinfo.dk/Portals/2/Benefit/Value_Assessment_Danish_Address_Data_UK_2010-07-07b.pdf . (78) DECA (2017). The impact of open geographical data – follow-up study, http://sdfe.dk/media/2917052/20170317-the-impact-of-the-open-geographical-data-management-summary-version-13-pwc-qrvkvdr.pdf . (79) Bregt, A., L. Grus & D. Eertink (2014). Wat zijn de effecten van een open basisregistratie topografie na twee jaar? Wageningen,Wageningen University: 49; Grus, L., A. Bregt & D. Eertink (2015). De effecten van open data BRT na 3 jaar, Wageningen University & het Kadaster: 7. (81) Finnish Prime Minister's Office (2017), Avoimen datan hyödyntäminen ja vaikuttavuus. Available at https://www.etla.fi/wpcontent/uploads/VNK_2017_40.pdf . (84) Impact Assessment Support Study, Deloitte, SMART 2017/0061. (89) Basic Data Programme, https://www.digst.dk/~/media/Files/English/Fact_sheet_BasicData_pdf.pdf . (90) Art. 6(2) of Directive 2003/98/EC, as amended by Directive 2013/37/EU, stipulates that "where charges are made for the re-use of documents, those charges shall be limited to the marginal costs incurred for their reproduction, provision and dissemination". (91) Open Data Institute, Estimating the cost of a government open data initiative, 10 September 2014, https://theodi.org/blog/estimating-the-cost-of-a-government-open-data-initiative . (92) Open Data Institute, Exploring Open Data Quality, 26 October 2016, https://theodi.org/blog/exploring-open-data-quality . (93) Open Data Quality, the Next Shift in Open Data, 31 May 2017, https://blog.okfn.org/2017/05/31/open-data-quality-the-next-shift-in-open-data/ . (94) Impact Assessment Support Study, Deloitte, SMART 2017/0061. (97) European Commission, Guidelines on recommended standard licenses, datasets and charging for the re-use of documents, 2014: https://ec.europa.eu/digital-single-market/en/news/commission-notice-guidelines-recommended-standard-licences-datasets-and-charging-re-use . (100) See for example Bastiaan Van Loenen, Michel Groete, “INSPIRE empowers re-use of Public Sector Information”, 2014, http://ijsdir.jrc.ec.europa.eu/index.php/ijsdir/article/view/353 . (102) 'Good practice in data and service sharing', http://inspire.ec.europa.eu/documents/good-practice-data-and-service-sharing . (104) Katleen Janssen, “The influence of the PSI directive on open government data: An overview of recent developments”, Government Information Quarterly, Volume 28, Issue 4, October 2011, pp 446-456. (107) Open Data Barometer, Global Report, Fourth Edition, 2017, http://opendatabarometer.org/doc/4thEdition/ODB-4thEdition-GlobalReport.pdf . (108) Directive 2007/2/EC of the European Parliament and of the Council of 14 March 2007 establishing an Infrastructure for Spatial Information in the European Community (INSPIRE), http://eur-lex.europa.eu/legal-content/EN/ALL/?uri=CELEX:32007L0002 . (109) Article 3 of the INSPIRE Directive: ‘spatial data’ means any data with a direct or indirect reference to a specific location or geographical area. (110) According to the Commission's Guidelines on recommended standard licences, datasets and charging for the re-use of documents, section 3.1, geospatial data, environmental data and Earth observation data can be said to be in highest demand from re-users across the EU and could thus be given priority for being made available for re-use. (111) Katleen Janssen, “INSPIRE and re-use of PSI. A model for the sharing and trading of geographic data”, 2004, https://www.law.kuleuven.be/citip/en/docs/publications/508inspire-and-psi2f90.pdf . (115) CKAN is not a standard, but a software platform, which is widely used for data catalogues in Europe. CKAN it is able to support different metadata standards, including the ones used in INSPIRE. (116) Opinion 06/2013 on open data and public sector information (PSI) re-use (WP207), adopted on 5 June 2013; see http://ec.europa.eu/justice/data-protection/article-29/documentation/opinion-recommendation/files/2013/wp207_en.pdf . (117) Regulation (EU) 2016/679 of the European Parliament and of the Council of 27 April 2016 on the protection of natural persons with regard to the processing of personal data and on the free movement of such data, and repealing Directive 95/46/EC (General Data Protection Regulation), http://eur-lex.europa.eu/legal-content/en/TXT/?uri=CELEX%3A32016R0679 . (118) Directive 96/9/EC of the European Parliament and of the Council of 11 March 1996 on the legal protection of databases, http://eur-lex.europa.eu/legal-content/en/TXT/?uri=CELEX%3A31996L0009 . (120) Combined Evaluation Roadmap/Inception Impact Assessment, Review on the Directive on Re-use of Public Sector Information, European Commission, 2017, http://ec.europa.eu/info/law/better-regulation/initiative/112354/attachment/090166e5b523f50f_en . (121) DG Internal Market and Services working paper, First evaluation of Directive 96/9/EC on the legal protection of databases, 12 December 2005, http://ec.europa.eu/internal_market/copyright/docs/databases/evaluation_report_en.pdf . (123) See original PSI Directive: 2003/98/EC Recitals 22, 24. (124) Conseil d'État, case N° 389806 of 8 February 2017: https://www.legifrance.gouv.fr/affichJuriAdmin.do?oldAction=rechJuriAdmin&idTexte=CETATEXT000034017890&fastReqId=803371859&fastPos=1 . (125) Compass-Datenbank GmbH v Austria (C-138/11, EU:2012) The case predates the last modification of the PSI Directive (2013/37/EU). (126) In the absence of case law it is not clear whether the legal basis for re-use of public information is related to the PSI directive or not. Information gathered from a stakeholder in the course of the public consultation on the evaluation of the Database Directive in 2017. Source: Free Knowledge Advocacy Group EU, Wikimedia. (128) The French Loi pour une République numérique (Loi Lemaire) has solved this interplay between the PSI and the Database Directives clearly stating that "Without prejudice to intellectual property rights held by third parties, the sui generis rights of public sector bodies as defined in Article 2, under Article 7§1 and §5 of the Database Directive, cannot hinder the re-use of the contents of the databases made available by these public sector bodies in application of the rules of the PSI Directive". This French law may be taken as an example. (129) Directive (EU) 2016/943 of the European Parliament and of the Council of 8 June 2016 on the protection of undisclosed know-how and business information (trade secrets) against their unlawful acquisition, use and disclosure, http://eur-lex.europa.eu/legal-content/EN/TXT/?uri=CELEX%3A32016L0943 . (130) Article 1, Directive of the European Parliament and the Council amending European Parliament and Council Directive 2003/98/EC on the Re-Use of public sector information, 2013, http://eur-lex.europa.eu/legal-content/en/TXT/?uri=CELEX:32013L0037 . (131) Strategic interview and minutes of the participatory workshop on Open Research Data within the context of the Public Sector and Information Re-use Directive. (132) Directive 2012/28/EU of the European Parliament and of the Council of 25 October 2012 on certain permitted uses of orphan works, http://eur-lex.europa.eu/legal-content/EN/TXT/?uri=celex%3A32012L0028 . (133) Study to support the review of Directive 2003/98/EC on the re-use of public sector information, SMART 2017/0061. (134) An orphan work is a work for which none of the right holders is identified or, even if one or more of them is identified, none is located despite a diligent search having been carried out and recorded in accordance with the relevant provisions of the Directive on orphan works. (135) Consolidated version of the Treaty on the Functioning of the European Union – Part Three: Union Policies and Internal Actions, TITLE VII: Common rules on competition, taxation and approximation of laws - Chapter 3: Approximation of laws - Article 114 (ex Article 95 TEC), http://eur-lex.europa.eu/legal-content/EN/ALL/?uri=CELEX:12008E114 . (138) Europeana is a digital cultural heritage platform for Europe, providing access to over 50 million digitised items (books, music, artworks and more). The Europeana Foundation was tasked by the European Commission to develop this platform. More information: https://www.europeana.eu/portal/en . (140) Policy action 4 of the Tallinn Declaration, https://ec.europa.eu/digital-single-market/en/news/ministerial-declaration-egovernment-tallinn-declaration .